Just as no two people share the same life fingerprints, no two massage therapists have the same touch. Who we are as people and the quality of our hearts is felt through our hands. This is our gift to each client: our imprint on every person we touch. We recognize the immense power we hold in our hands and the unique honor we are given every time we massage each unique individual. Grace has practiced and taught massage and bodywork since 2005. She is a lifelong learner and helper who is fascinated with health, wellness and creating a balanced body. Grace graduated from the Muscular Therapy Institute in Cambridge Massachusetts where she learned the Benjamin System of Muscular Therapy. Since then has continued her education with Myofascial Release, Neuromusular Therapy, Occupational Therapy, Reiki, and massage cupping. Graziella uses a combination of massage modalities in each massage. Her expertise lies in the ability to carefully listen, observe, and interact with you. Then, she delivers a treatment plan that works. Her hands simply see and hear what your body’s tissue needs. Graziella creates a healing experience where you feel cared for and comforted with skillful compassionate touch. Sandy went to Catherine Hinds Institute of Esthetics in Woburn and did the 600 hours program. She got her esthetic license and graduated in 2012 in one of the most well-known school for esthetic. Working from different shops in esthetic, Sandy gained her experience and knowledge and came back working in her hometown. By working at Tranquility Day Spa for years, she is currently an Esthetician License 6 card holder. ​Sandy expanded her knowledge in biboting cupping, which is a cupping method well-known in Asia. She wants to continue helping others in different ways so she learned and continues to practice biboting cupping hoping others will also learn how this machine can make a difference in someone’s health. Sandy continues her dream and created Detox and Wellness as her own business. 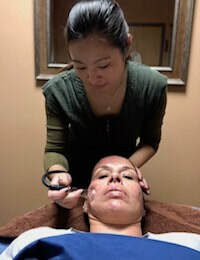 Sandy specializes in skin care, facials, waxing, and biboting cupping. You can reach Sandy at 857-222-3159 or wusandy1015@gmail.com.